2014 saw the return of Northside with a series of triumphant comeback shows and the release of Shall We Take A Trip?, an all-encompassing compilation of their time around their debut album Chicken Rhythms. As they prepare new material for release in 2015, they're taking time out to headline Sound Control's 5th birthday party this Thursday and we caught up with front man Dermo for a look back at 2014 and at what's in store in 2015. It's nine months since you announced you were reforming and played your first dates, how do you feel the reaction has been to you playing again? The reaction has been great, especially by the fans of the band. The response off the audiences at the gigs has been very positive and to be honest, a bit unexpected. To come back after twenty years and see the reaction of people before and after the shows has been so special to us as a band. They've made us feel welcome and happy to be back. We've got a great fan base and we really appreciate them. What have been the best moments since you started playing together again? The first rehearsal, when the people who created this music clicked again, pretty much instantly. That knowing look between us, that speaks a million words, that would have taken years to say to each other. It really is like we've never been apart. And starting to write completely new songs has been a proper buzz for us too. We look forward to finishing and then recording them in the near future. Was there a sense of unfinished business, that you'd been treated unfairly because of the backlash towards you and other bands when the press moved away from the Manchester scene? There was a sense of unfinished business, but not so much because of any kind of backlash towards the 'Manchester' scene although there was some very bitter journalists around at that time, but because we felt we hadn't reached our true potential. Factory collapsed, we were still very young at the time and we were left with all these unheard demos and ideas for new material. I also believe we've got a good few albums inside of us yet, that are desperate to get out. You've talked about taking a break after this show until towards the end of the year - is there anything you can share with us about what you've got planned? Not really taking a break as such, just concentrating more on playing some summer festivals, plus a couple of special gigs and the recording of a new EP for a release as soon as possible. There's quite a bit going on behind the scenes. Things will become more clearer over the coming weeks. 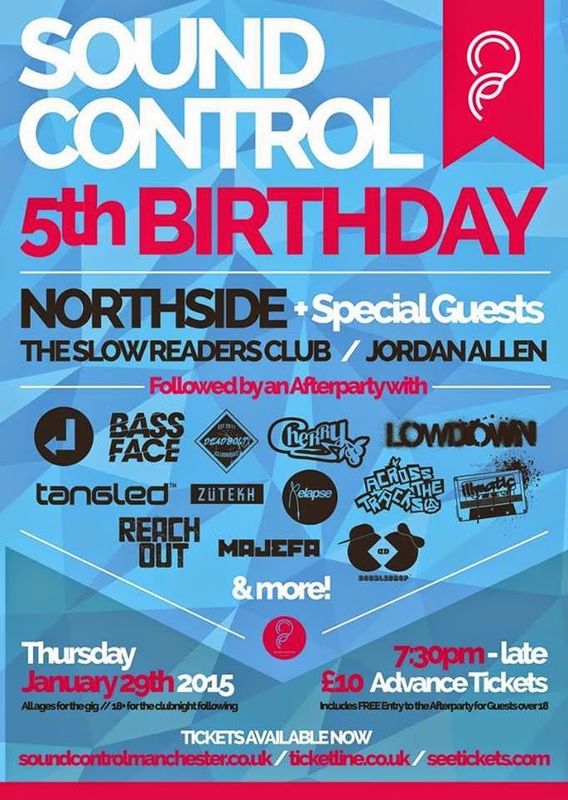 You're playing Sound Control's 5th anniversary on Thursday - how did that come about? I have known Ben Taylor (Sound Control - Events Manager) for some time and I DJ'd at the opening night in there. It's one of Manchester's best venues and I admire the way he has looked after and continues to successfully run it, during some of the hardest times of this on-going recession, practically filling the place every night. He works really hard and is a great observer of what's happening with his ear to the ground. Not only that, he's very hands on with all the club nights and bands he puts on, which doesn't go unnoticed. He's the kind of person we like to work with. Back to how the gig came about... I bumped into Ben at a recent Howling Rhythmn Soul Club night at The Ruby Lounge. We got chatting about the band and he asked me if we'd like to headline the 5th birthday party at Sound Control as I'd been one of the first to DJ in there and he's a fan of the band too. It's something we both agreed was a good idea and would be a great way of both giving thanks and so here we are. We're really looking forward to the gig on Thursday, it'll be a proper party atmosphere and there's a couple of top support bands on, The Slow Readers Club and Jordan Allen. Plus there's an after party with loads of cool DJs too, including me old pal Gareth Brooks. What's not to like? It's on!